Santa Claus graciously took some time out of his busy schedule to talk with the Leduc-Wetaskiwin Pipestone Flyer. 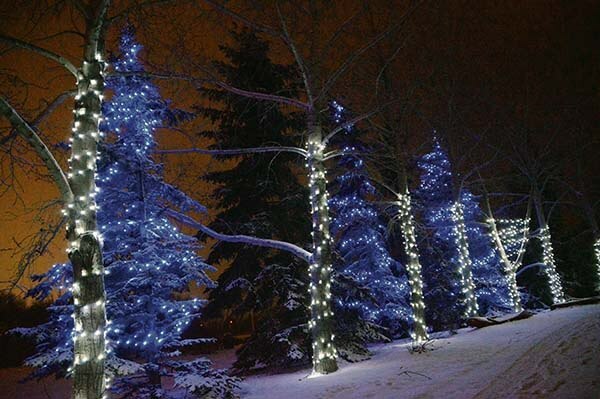 Dec. 30, 2015 11:00 a.m.
Telford Lake in Leduc has been beautifully decorated this year. Despite coming up on his most hectic time of year, Santa Claus graciously took some time out of his busy schedule to talk with the Leduc-Wetaskiwin Pipestone Flyer before getting back to work in his North Pole toy shop. Santa Claus says in preparation for his big Christmas Eve flight he always makes sure to get a good night sleep; a solid eight hours. He also makes sure to eat a hearty breakfast in the morning and can head out immediately afterward, while it’s still dark, to begin delivering toys. “Porridge, that’s important,” said Santa. “Unless it’s kicking back after, having turkey dinner,” he added. Santa says after a long flight and squeezing down all those chimneys he loves being back at home with his much loved Mrs. Claus and inviting all the elves over to the house for a turkey dinner. The Christmas tunes are another instrumental part of Santa Claus’s holiday and two of his favourite song are Deck the Halls and especially Jingle Bells, which he believes can be enjoyed all year long, as one can always find a bell to ring. Santa says Rudolph and the gang try to stand real still while they get decorated to look their most dashing.